The Australian Himalayan Foundation’s (AHF) first Teacher Training and Quality Education Program was inspired by the work of Sir Edmund Hillary that has benefited the Everest (Khumbu) district of Nepal since 1961. Nepal faces large disparities in literacy rates between urban and rural areas. In addition, teachers in rural Nepal receive little or no training and regularly resort to basic rote-learning methods. 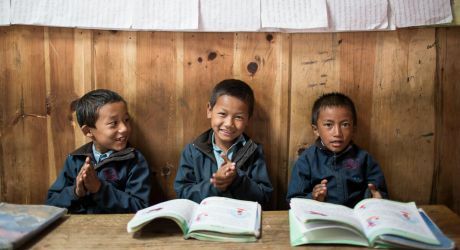 Without access to a quality education, children in remote communities like the Everest region of Nepal remain deprived of the life skills and knowledge gained from education and are more likely to remain trapped in the cycle of poverty. In response to this need, the Australian Himalayan Foundation’s (AHF) flagship Teacher Training Quality Education (TTQE) Program is helping to ensure that all children have access to a quality education that can lift them out of poverty. TTQE focuses on training teachers in the remote Solukhumbu district of Nepal with the goal to ensure that children have better opportunities in life through an inclusive, high quality education. The program currently builds the capacities of over 1700 teachers in 300 schools and enhances the quality of education for around 30,000 school children in Solukhumbu, with an expected far reaching impact on the broader community. The long-term objective of the TTQE program is to help over 42,000 children and 1700 teachers in over 300 schools in remote, rural areas. The program also provides education support to marginalised and vulnerable children who for various reasons may not be attending school. Last year, this educational support enabled 550 students including 346 girls and 25 children with a disability to attend school. Accredited by the Nepalese Government’s National Centre for Education Development and implemented in coordination with the Ministry of Education, AHF’s Teacher Training and Quality Education program is recognised as one of the most comprehensive education programs in Nepal. TTQE is implemented on the ground by the AHF’s Nepalese NGO partner REED Nepal with the technical support from the AHF in program design, management, monitoring and evaluation. Monitoring and evaluation systems targeting under-performing schools and closely monitoring teachers to encourage better outcomes through in-school support continues to be an effective means of supporting implementation of the training. Trainers from REED visit the schools in remote communities to observe the training in-school and provide valuable feedback and ongoing support. The Australian Himalayan Foundation is a registered charitable organisation, a member of the Australian Council for International Development and accredited by the official Australian Aid program (DFAT). The TTQE program now operates in every single district and reaches every single school in the lower Solukhumbu or Everest region. This achievement is part of a fifteen-year vision the AHF has for the region - one aimed squarely at improving the quality of and the access to a life changing education. Over the years, thousands of travellers have visited the Himalaya. For many it is an opportunity to trek beneath the world's highest peaks and to appreciate some of the world's most hospitable cultures. Yet the Himalaya is not just a vast adventure playground. For the local communities it is anything but easy – with access to basic health and education services often out of reach. 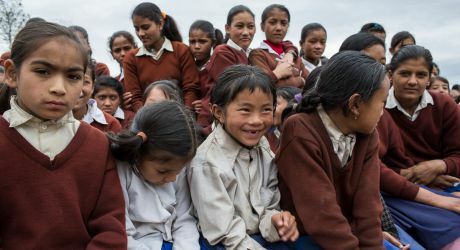 Following in the footsteps of Sir Edmund Hillary who was devoted to bringing education to the Sherpa people, the AHF is working in partnership with local communities to help the people of the Himalaya through improvements in health, education and conservation. Giving to the AHF is an opportunity to give something back.